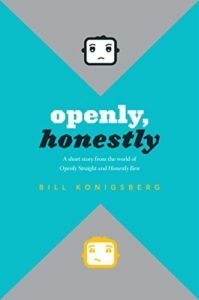 I’ve been eagerly awaiting the sequel to Bill Konigsberg’s Openly Straight for sometime now. Honestly, Ben arrives at the end of the month. In the meantime, Bill released a short story, Openly, Honestly, to bridge the two books so we can reconnect with Ben and Rafe and where they are in the aftermath of the events of Openly Straight. Openly, Honestly is set over the holiday break that comes after the first book–after Rafe has come clean with Ben and destroyed their relationship. Both boys miss each other. Rafe doesn’t know how to fix what he’s done and his best friend, Clare Olivia, is trying to give him a present to take his mind off the situation. Ben, meanwhile, is at home with his family with no one to talk to about what happened. He still finds a good time with his family though. It’s only five chapters, but Openly, Honestly was a nice appetizer ahead of Honestly, Ben. To whet the appetite even more there is a sneak peak with two chapters from the new book (and those chapters have me all the more anticipating the book’s release).